This sculpture is intended to be show with the video, Tie Them Up. The sculpture depicts the legs of two different wolves tied together at the feet. The legs appear to be coming out of the wall, as if entering from another unseen space. Together the video and sculpture try to take a literal look at two metaphorical wolves. The video reveals the green screen and the sculpture reveals its handmade materials. 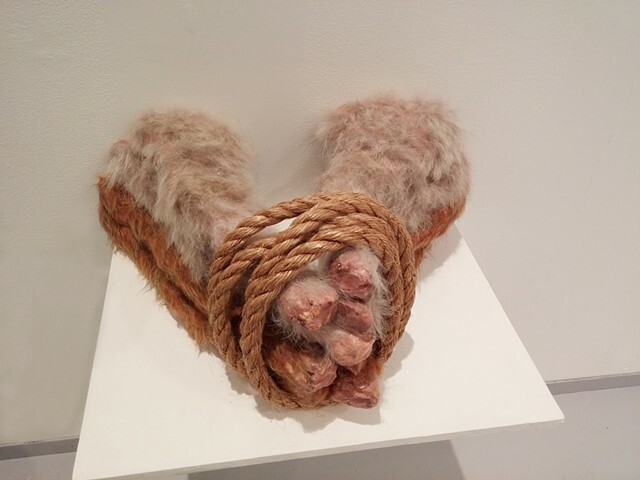 They acknowledge this imagined space inside of the self, while still using real fur and rope. The work blends what is real and imagined, what can be touched, and what is only an idea.